Upon arrival in the Lucas Artists Residency Program, Ali Naschke-Messing was immediately drawn to the enormous Bunya Pine (Araucaria bidwillii) on the Great Lawn and was inspired to create a site-specific work. 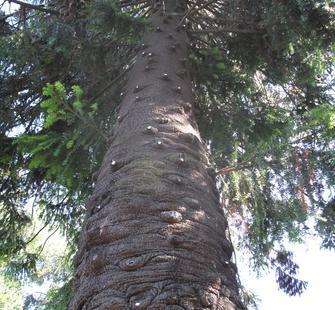 The tree's outer bark is characterized by multiple bulbous whorls that form around holes where branches once grew. Naschke-Messing inserted mirrors into these holes to call attention to the tree's overall presence, its historical growth patterns, and to highlight the sunlight itself. The tree reflects fragments of its surroundings - the sky, ground, and surrounding trees - that become visible on the surface of the Bunya. Visitors see bits of themselves, their families, and their immediate environment reflected back at them through the bark of this monumental tree.